Hello! As the sun has been shining for the past few days in the North, I thought it was about time I had a serious thought about what things I want to add to my wardrobe for Spring. White, black, light blue and bright yellow will be my colour palette of choice, as they just look so clean and fresh. Way better than the dark hues of Winter which I’m definitely over now! I’m desperate to get my hands on a pair of really good boyfriends that fit and suit me, as opposed to making me look short which a lot of them do. I think I also need more checks in my life, as I don’t have enough Spring ones, just my heavy tartans which shall be placed firmly at the back of my wardrobe. I’ve always loved bright yellow and light blue, so will definitely be looking for pieces in those shades on my next shopping trip. 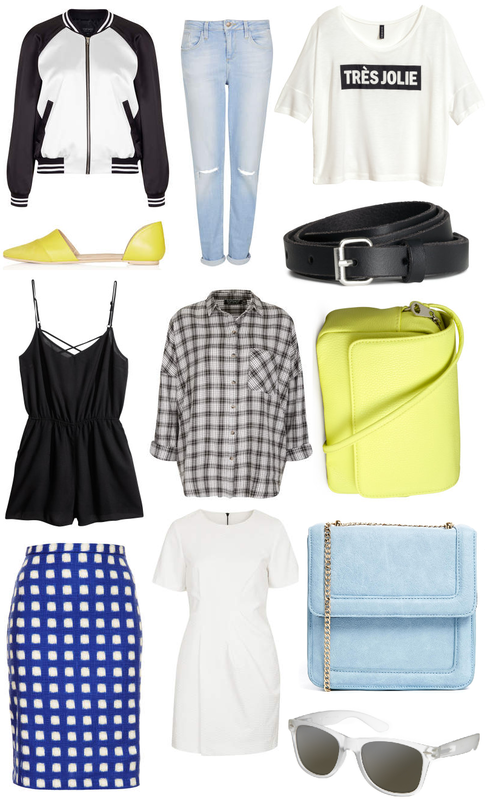 I basically want to buy everything on this list as I think it’d make up my perfect Spring wardrobe. We’ll have to see how far my bank balance stretches with that one! I’m also going to try my hardest to wear more skirts. Yes, I know I’ve worn that amazing denim one recently, but they’re the most neglected part of my wardrobe. I’m desperate to get into wearing midi skirts, as people always look so chic in them but I’ve never ventured into that side of skirts yet. So, I’ll be scouting some fashion blogs for skirt wearing motivation and outfit inspiration to see if I can work this item into my daily outfits! Anything you’ve got your eyes on anything this Spring?